It’s summer time, and they are home with you. Yes, we can enroll them in sports camp, art camp, dance camp, you name it camp, but we know that it can get quite pricey. Finding activities to entertain and if I can say, educate, the kiddos as they climb around at home can be tough. In my desperation to entertain my 8 and 4-year-old girls, I created a fun backyard game that I knew would take them some time to complete and get them outside experiencing the outdoors. The game was incredibly inexpensive – it cost me no money whatsoever! Money saved for our next family vacation! Using the backside of a poster board, I began to list items for the girls to search for in and around the backyard. I described the items by color and/or shape and even size. This backyard hunt was a scavenger hunt of sorts. I drew a large rectangle below each item for them to adhere the item. They had a blast running around trying to find the items. I partnered them up because of their age difference. Make a list of at least 6 items to be found. It can be as specific as a 4-inch pinecone, to as broad as a piece of nature that is brown. Provide tools like tape or a camera if you want them to photograph the items they find. At a timer to make it more of a race. Make the hunt indoors if weather isn’t cooperating. Encourage the kids to make the hunts themselves. This will take the responsibility off of you and get them involved. They will have fun challenging their siblings and friends to find the items on their list. This activity is great with a group of kids divided into teams. Summer time is the perfect moment for the kids to run around and experience the outdoors. 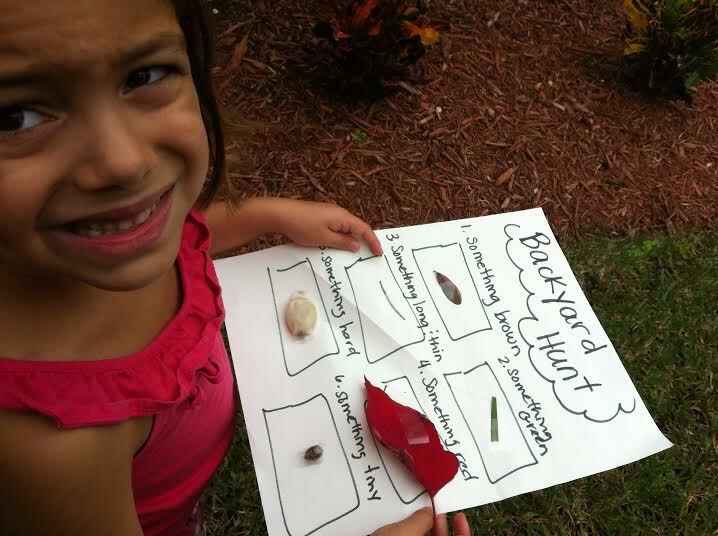 A Backyard Hunt is a perfect activity for fun in the outdoors at no cost for the parents! Enjoy and happy hunting!